It’s a well-established tenet that most midterm elections are functionally referenda on the president of the United States. And the particular president in office right now helped make the 2018 midterms emphatically about himself via high-profile campaigning and some characteristically inflammatory behavior designed to energize his supporters and opponents alike. In the midterms of 2006, 2010, and 2014, between 84 percent and 87 percent of voters who approved of the president’s job performance voted for his party’s candidate in their local House race, according to exit polls. 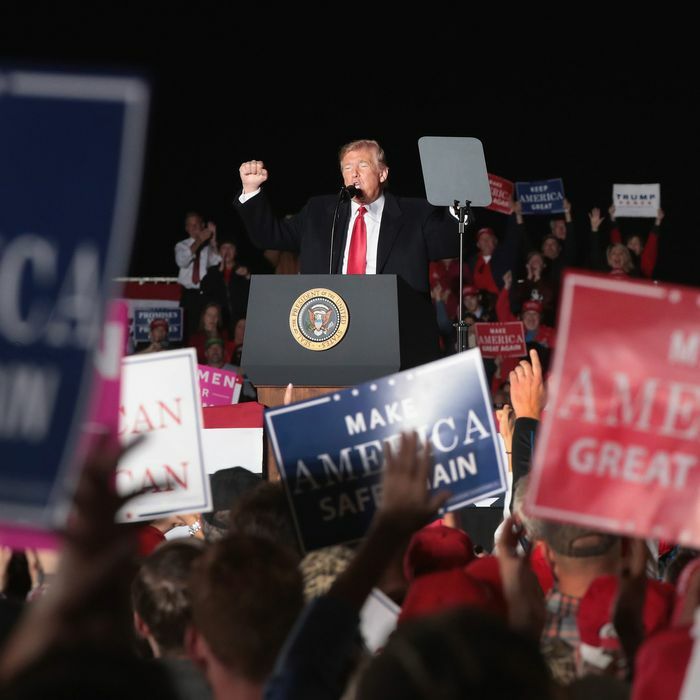 Last week, 88 percent of Trump approvers said they backed Republicans for the House, according to results from the Edison Research exit poll, which was conducted for the National Election Pool and published on the CNN website. Likewise, in those previous three midterm exit polls, between 82 percent and 84 percent of voters who disapproved of the president voted against his party’s candidates for the House. But on Tuesday, that number soared: Fully 90 percent of Trump disapprovers said they voted for Democrats for the lower chamber. That was the worst performance for the president’s party among disapproving voters since Ronald Reagan in 1982. Of the 47 districts where Trump took less than 51 percent of the vote, Democrats have (so far) won 32 of them. If we exclude Utah’s four districts (in which Trump’s vote share was depressed thanks to the presence of third-party candidate and Utah native Evan McMullin), Democrats will have won at least 74 percent of the districts held by Republicans where Trump was the weakest in 2016. For all the talk that open seats are what doomed Republicans, well-prepared incumbents weren’t any more resilient to the wave than GOP challengers. Only seven (non-Utah) Republicans outperformed Trump in their districts by more than five points. Five of those Republicans were incumbents; two were in open seats. Of those seven, only two of these strong over performers won: Reps. Mario Diaz Balart (FL-25) and John Katko (NY-24). Led by House Speaker Paul Ryan and Senate Majority Leader Mitch McConnell, House and Senate Republicans made a strategic decision to lock arms around Trump over the past two years. They resolutely rejected any meaningful oversight of his administration; excused, or even actively defended, his most incendiary remarks; buried legislation to protect Special Counsel Robert Mueller; and worked in harness with the president to pass an agenda aimed almost entirely at the preferences and priorities of voters within the GOP coalition, including tax cuts and the unsuccessful attempt to repeal the Affordable Care Act. Even as Trump’s presidency careened through daily storms, many of his own making, they lashed themselves to its mast. In Senate races, where even in this day-and-age ticket-splitting is more common, presidential dominance was less emphatic, though it did play a role. In the five states with Democratic senators up this year that Trump carried by at least 15 points, Republicans won three seats (all but Montana and West Virginia). In competitive Senate races in states Trump lost or carried by less than 15 percent, Republicans won in Texas but lost in Arizona, Michigan, Minnesota, Nevada, Ohio, and Pennsylvania, with Florida still pending. It is reasonably clear that without Trump in the White House, Republicans would have done better in Senate races, notwithstanding his intense campaigning for GOP Senate candidates down the stretch. It’s the amazingly skewed landscape, not anything Trump did, that saved the Senate for the GOP. If Republicans were tied inextricably to Trump in a midterm election when candidates have been known to stray from POTUS’s orbit in the past, their status as Trump vassals will be even less in doubt in 2020. They better hope that either Trump finally gets his job approval ratings into positive territory for the first time since the first couple of weeks of his presidency, or that Democrats again manage to find a nominee even less popular than Mr. MAGA. The president’s good friend thinks he knows more about Pete Buttigieg”s sexual orientation than Mayor Pete’s creator. While today’s child stars can achieve incredible fame and fortune without ever setting foot in a Hollywood studio, they may be missing out on one of the less glitzy features of working in the southern California-based entertainment industry: the strongest child labor laws for performers in the country. Those laws, which were designed to protect child stars from exploitation by both their parents and their employers, are not being regularly applied to today’s pint-sized celebrities, despite the fact that the major platforms, YouTube and Instagram, are based in California. The situation is a bit like “Uber but for … child labor”, with a disruptive technology upending markets by, among other things, side-stepping regulation.